As usual, the first important stop on my way to our timeshare above South Lake Tahoe was the Lockford Meat Service sausage shop. There I stocked the cooler with prime New York steaks, fresh and smoked brats, Dakota smoked, and apple sausage. From there I took my time passing through Jackson, then up and over the mountains with brief stops at Silver, Caples, Red, and Woods Lakes. It was as hot as I'd ever seen mid-August at the higher elevations and all these waters were crowded with shore anglers and sunbathers. The good thing was August was the only month I had not seen it snow in Alpine County. 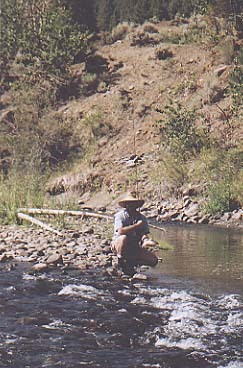 The bad thing was that ninety-eight degree afternoon heat on the East Fork every day for a week was as hard on us as it was on the fish. I didn't get back out for Saturday evening fishing, but put in several hours on the river on Sunday with moderate success. The heat must have kept the weekend crowd off the river and there were fewer anglers as the week progressed. The plan was to meet club members Monday at Hangman's Bridge for a picnic lunch. Larry Mitchell arrived first, having traveled up that morning. 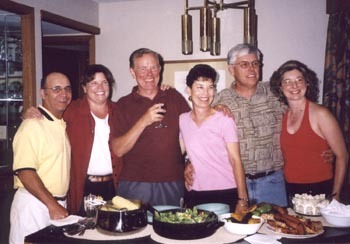 Right on schedule, Ron Kilgren, John and Karen Margaroni, Richard Holubek and Debbie, Connie and Elaine Kuzmicki (who recently purchased a property south of Minden), Mandy Anderson, and my wife, Anne, appeared. We decided to drive the short distance back to Markleeville and sit by the creek on two picnic tables we moved into the shade. The ice-cold watermelon, after sandwiches, invigorated me enough to hit the water again while the others checked into the Carson Valley Lodge and Indian Creek Reservoir campground. The put-and-take section above Hangman's Bridge fished fairly well with small attractor dries for mostly eight-inch rainbows. I moved back to the trophy trout catch-and-release area downstream of the bridge where Mandy met me at six o'clock. There was a flurry of surface action at 7:30undefineddozens of small fish leaping from the water in their efforts to gulp midges and small mayflies in the pools. Tuesday morning Larry met Mandy and me at the bridge at eight o'clock to start the trek down a gated jeep trail to the gaging station. On the hike I veered off the road occasionally to search for Indian artifacts between the rabbit brush and desert sage, being rewarded with a small obsidian projectile point. The 1.9 miles seemed longer than usual in the early morning heat. Water temperatures started out at fifty-nine degrees, warming to seventy-two by mid-afternoon. Fishing was toughundefinedwith my best fish going only about thirteen inches. After a couple of hours, Larry elected to depart near the river rafters' lunch area, which is the only easy connection back to the trail. We met Ron not too far above the gaging station and spent time discussing his experiences. We left him at a large pool where he changed flies twenty-two times before enticing one particular fish he wouldn't give up on. Ron has a wealth of knowledge about all aspects of trout fishing that he willingly shares. He also spent considerable time turning rocks, finding at least one clinger mayfly nymph with which he was not familiar. Getting to know great folks like Larry and Ron on the water is one of the benefits fly club membership offers us. Mandy and I worked our way on upstream, fishing most of the way. Since very few other fishermen were out, we chose only the best water with a hit-and-run method. Not travelling with a water bottle, I made more of a mad dash the last quarter-mile to the car for a cold beer and sandwich of picnic leftovers. Mandy's extra time on the water yielded a few more smallish fish. As planned, Tuesday night we all met at Fiona's, a restaurant next door to the Carson Valley Inn. Eleven of us congregated in the bar before dinner. They have changed their menu this year so give them a try if you haven't been there recently. Portions were generous, especially Connie's twenty-four ounce prime rib. They have also started serving a featured wine of the month that is reasonably priced. Larry drew the winning number for a book on Alpine County history and attractions that Anne and I "raffled" for our guests. Wednesday found everybody back on the stream at an earlier hour. We met Richard, Debbie, John, and Karen at the "long hole" as Mandy and I headed down river and they were coming back. John had landed a nice fifteen-inch rainbow, one of the better fish of the week. We saw quite a few larger fish in pools but they were reluctant participants in our sport. Richard and I cast over and over to a number of good specimens at this long pool, receiving some of the most sophisticated refusals over and over also. I think they were counting the tails on my red humpy. The ladies seemed to be taking a liking to this fly fishing thing. Wednesday evening most of the group came up to our place at The Ridge Tahoe for a barbeque. Lots of sausage, chicken breasts, and vegetables filled the grill. Ron placed the phone book under the gas grill's front edge to correct its tilt and reassured me that fire would fix anything that I managed to let roll onto the patio floor. I think everyone ate well again. After dinner our son Brandon and Mandy's son Angelos introduced our company to the game of Beyond Balderdash. Nobody seemed to mind our not keeping score (for the game or drinks consumed). Others departed Thursday morning, so Mandy and I took the day off to recuperate and drive over to Tahoe's Emerald Bay with Anne and the kids. 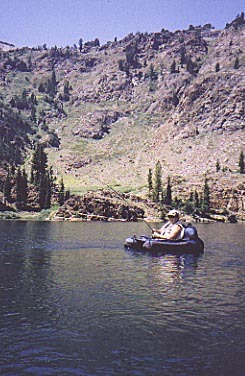 We did resume fishing though on Friday, four-wheeling the two miles off Hope Valley up to Crater Lake. It is a beautiful spot at about 8600 feet that we had to ourselves after two bank fishers and one camper packed up. There were lots of colorful brook trout to keep us busy in our float tubes. After a couple of hours we headed off the other side of Route 88 for the six-mile, gentler drive up to Burnside Lake where we both hooked up to larger fish, this time rainbows. At this elevation the weather was great, with warm temperatures, sixty-one degree water, and very light breezes, quite a change from the hot valley afternoons we had experienced. Saturday brought a close to our week at the timeshare. I convinced Anne that since I had a few more days off and was already on the east side of the Sierras (on the crest technically speaking), I should head south to the Mammoth Lakes area for more float tubing. 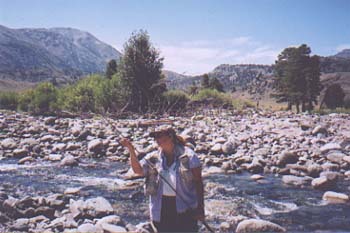 Mandy and I headed off, fishing the West Walker River along the way. It pained us to see the canyon section had recently fallen victim to fires. It was wiped out (deforested and the streambed rerouted in areas) by the New Year's Day flood of 1997, and was just starting to recover. We spent only a short time playing with planted fish before heading off Route 395 onto 108 west to Pickle Meadow. I landed fourteen rainbows there in about an hour; Mandy stopped counting. Next we continued south past Mono Lake with a detour to check out Rush Creek. Deciding not to stop on the June Lake Loop, we were checked into the motel by 6PM. Dinner from the cooler and an early evening soak in Hot Creek topped off the evening. 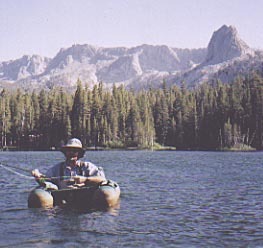 We had fished the San Joaquin in Red's Meadow in late July and weren't up for a hike so we concentrated on the lakes. The stark beauty of Convict Lake is worth the short drive up a paved road just south of Mammoth. Calm winds continued to prevail, making float tubing delightful. There were only a couple of power boats on the lake and a couple of other float tubes. We saw some really good-sized fish jumping which eluded us. The shore anglers were bagging limits of fourteen-inchers. The restrooms with running water get my vote for the cleanest in the Sierras. We drove over to Crowley's north shore to check it out and found all the boats that were missing from Convict. Being told the hot action had slowed, we decided to beat the heat again by going up to Lake Mamie. We fished Lake George first, as Mamie looked pretty crowded, but we did return for the late afternoon when the weekenders cleared out. It was surprisingly shallow, but held lots of trout, including some large Alpers! Plus you can access these lakes by falling out of your car (if you find weekend parking). These and other adjacent lakes would be great spots to hit for an hour or so each if your non-fishing family comes along. I'd make the trip just for the scenery. That night it was dinner at Shogun where the Hispanic sushi chefs have yet to figure out the size and shape (and cost to them) of properly cut sashimi, serving up hugh portions before our calamari tonkotsu, sukiyaki, and teriyaki steak. I'll be back for both the food and serene spots we floated. It is a small world when you fly fish. Across the hall from us at the motel we encountered Kelly Mitter and friends who were backpacking the next morning. Maybe he'll write for us about accessing the higher country for countless, feisty little fish. On the way home we stopped again in Pickle Meadow and finally at the Stanislaus River a few miles west of Kennedy Meadows. Water flows were excellent and we concluded our fishing in another beautiful bit of the Sierras. I used to experience a little sadness driving home at trip's end, but I've figured out how to prevent this feeling. Now I never start that drive back without having a definite plan for the next adventure. September 21st. I'll be back. Hope you will too.